Pour broth in 4-cup glass measuring cup. Add rice and rosemary; stir and let stand about 8 minutes or until most of liquid is absorbed. In small bowl, stir together mustard, 2 tablespoons of the olive oil, the garlic, 1/2 teaspoon of the salt and 1/4 teaspoon of the pepper. Set aside. In large bowl, mix zucchini, carrots, remaining 1 tablespoon oil, remaining 1/4 teaspoon salt and remaining 1/4 teaspoon pepper. Divide rice mixture among foil sheets. Brush both sides of chicken with Dijon mixture; place 1 on top of each mound of rice. 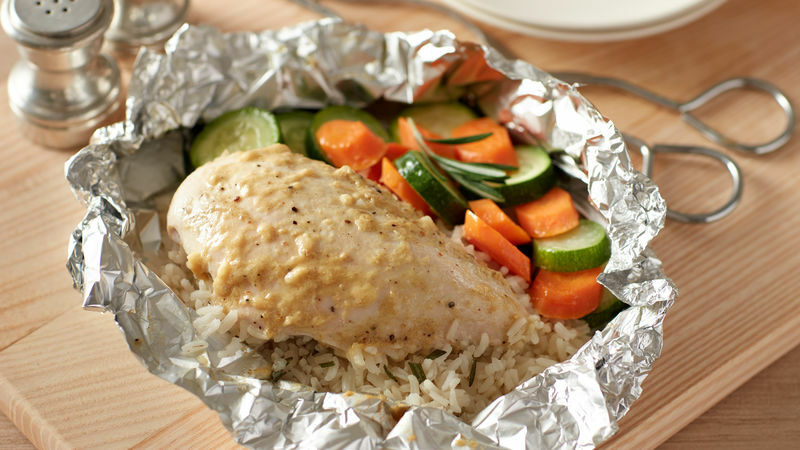 Divide vegetables among foil sheets, placing them next to chicken breasts. Place packets on grill over medium heat. Cover grill; cook 18 to 20 minutes, rotating packets one-half turn after 10 minutes, until juice of chicken is clear when center of thickest part is cut (at least 165°F). Place packets on plates. Cut large X across top of each packet; carefully fold back foil. Soaking the rice in broth before grilling the packets not only adds flavor to the rice, but ensures it will be done at the same time as the chicken and vegetables. If baking, heat oven to 400°F and place packets on cookie sheet; bake 25 to 30 minutes or until juice of chicken is clear when center of thickest part is cut (at least 165°F).